Welcome to the Sibling Writery’s first “Reading and Refreshments,” a monthly event dedicated to encouraging families to read out loud together. You see, in our family, we don’t only enjoy writing together; we love reading together as well. One of us picks out a book, and then the whole family gathers to listen. Usually we three siblings will take turns reading chapters—easier on the throat—unless the book is somebody’s particular favourite, in which case we might allow them the privilege of a solo reading. Reading out loud should not only be relegated to little children’s bedtime stories. There are many marvellous novels that can provide hours of delightful entertainment for a whole family. In “Reading and Refreshments,” we hope to provide you with some ideas for books that your family might enjoy, as well as appropriate goodies to serve during the reading. This month we chose to read Psmith In The City by P. G. Wodehouse, a prolific author from the first half of the twentieth century. Wodehouse is one of the funniest British writers ever, and an all-time favourite in our household. Psmith In The City was the second of his novels to feature one of literature’s oddest and most endearing pairs: the monocled, debonair Psmith (“the ‘p’ is silent, as in pshrimp”) and his blunt, cricket-playing comrade Mike Jackson. In Psmith In The City, the duo find themselves, much to their own discontent, working in the London branch of the New Asiatic Bank, under the supervision of a manager who has a personal animosity against each of them. The witty dialogue and Psmith’s brilliant manoeuvring to bypass the domineering manager provide lots of laughs, and the ending is a heart-warming moment of true friendship. Psmith In The City is not a long novel, so it is ideal for a first try at reading out loud. To accompany the reading, tea or coffee is a must, as Mike and Psmith often slip out to nearby coffee shops during work hours in order to talk and lay plans. 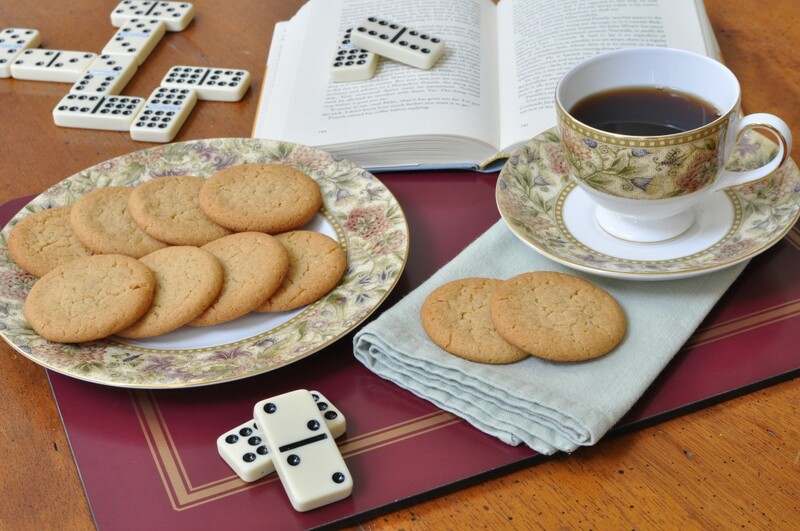 And we encourage you to make some proper British biscuits to accompany your beverage of choice (recipe is included below), even if Psmith is doubtful as to the quality of the delicacies offered at the local teashop. And then, if you want to make an evening of it, a game of dominoes would round the entertainment out nicely—don’t let Psmith’s disparaging remarks discourage you. Psmith, moving a box of dominoes on to the next table, sat down. If you decide to hold your own “Reading and Refreshments,” we would love to hear about it! Tell us how your family enjoyed the book and whether or not you made the treat to go with it. If you can, send us a photograph as well. You can contact us at thesiblingwritery@hotmail.com. “Reading and Refreshments” will be featured every month, so keep your eye out for upcoming suggestions! Note: In England, cookies are called biscuits. These biscuits are similar to gingersnaps, though not quite so crisp. They are particularly well suited to dunking in tea or coffee (the kids can have milk), and have a touch of butterscotch flavour. *This British sweetener is usually sold under the brand name Lyle’s Golden Syrup, and can be found in either the baking or syrup sections of grocery stores. The thick syrup has a lovely, toffee-like flavour. You can use any extra for drizzling on pancakes! Preheat oven to 350°F. Prepare two baking sheets by greasing them well with butter. In a small bowl, whisk together the flour, salt, ground ginger, and baking soda. Set aside. In a larger bowl, cream together the butter and granulated sugar. Slowly pour in the golden syrup, beating vigorously. (Of course, you can always do this in a stand mixer fitted with a paddle attachment instead.) Add the vanilla extract. Add the dry ingredients to the butter-sugar mixture in a few additions and stir well to form a soft dough. Take scooping tablespoonfuls of the dough and roll them into balls. Place them on the prepared baking sheets and gently flatten into discs with your fingertips. Bake the biscuits until the edges are set and the colour is golden brown, 10-13 minutes. Remove from the oven and let cool on the baking sheets for five minutes. Transfer to a wire rack to cool completely. Store biscuits in an airtight container at room temperature or in the freezer, well wrapped. They improve with age, so feel free to make them the day before you actually intend to serve them. Previous Previous post: Also Available on Amazon!